We typically work with Private Clients, Commercial Clients, Estates and various Committees. Our work is varied and the selection of items below is a shortlist of the many things we can do. Please telephone us to discuss a project. We also provide a free consultation to discuss a potential new project. First and foremost, we are a design led architecture practice. Good design is at the heart of every decision we make. Our aim is to create a sense of delight in every design commission. We aim to add value through good design. Over the years we have picked up several industry awards for our design work. A listed oak Tudor lattice gable we have had repaired using conservation techniques. We work with listed buildings and structures and non listed heritage assets regularly. These can vary from 60 thousand square foot country houses set in their own landscape to a small cottage in a National Park or Town. Stone + Associates has a very good understanding of both the statutory requirements, and the craftsmanship required to repair or alter heritage assets. Through years of experience we can usually confidently advise our clients and guide them through the process of acquiring the necessary consents to undertake work to a listed building or within a conservation area. Please view our portfolio page to view completed projects where we have undertaken significant conservation-led repair work. 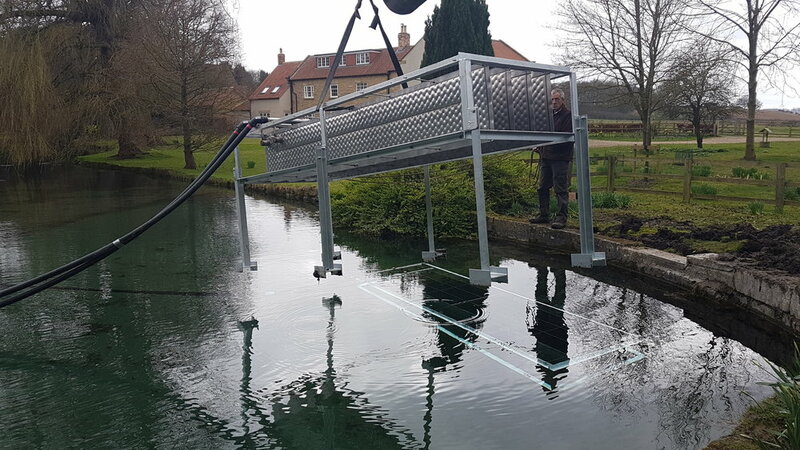 Pioneering energy blades placed in a lake linked up to a heat pump to provide heat and hot water to a large period property. Stone + Associates has specialist knowledge in the whole house refurbishment of older properties to save energy and implement more cost effective heating systems. We have a catalogue of old buildings, large and small, in which we have instigated the re servicing and thermal improvements of. We have carefully taken apart sections of buildings so that you would never know the work had been undertaken. We have successfully worked on small and large projects for private clients since the formation of the practice. Private clients represent over fifty percent of the buildings we design. For most people this is the first time they have considered building works. We are here to take your ideas forward and turn them into reality as well as professionally guide you. Our approach is design led which means we are not the cheapest, but we like to think that we offer good value and an end product you will be very proud of. We regularly work with commercial clients who require a design led approach to help make their business stand out. We have designed or altered; stately homes, wedding venues, pubs, restaurants, shops, cafe’s, visitor centres, show rooms, equine stabling, specialist buildings and some large sheds. Stone + Associates has a long history of working with Estates and Farmers. We have designed and built many new houses for farmers with regard to succession plans. Some of our longest repeat clients our the Country Estates we work with. In some cases we have undertaken over 10 substantial projects for an individual estate and provide ongoing support. We have a deep understanding of country estate requirements, we understand what is required to alter or repair large properties and we try to offer a service that adds significant value and builds a long-term working relationship. We have achieved several “Part Q” barn conversions and agriculturally tied homes.